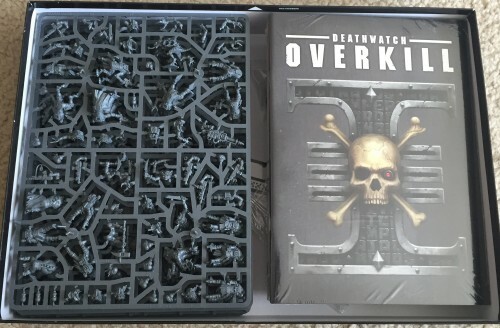 On February 27th, Games Workshop releases its newest Warhammer themed board game with Deathwatch: Overkill. Similar to the 2014 re-release of Space Hulk, Deathwatch: Overkill pits a squad of Space Marines against an army of Tyranids. Of course, instead of Blood Ravens, this time around the Space Marines are the Deathwatch, a crew of warriors assembled from across the Adeptus Astartes to purge the Xenos threat on behalf of the Inquisition. As well, instead of run of the mill Tyranids (as if there was ever such a thing), Deathwatch: Overkill brings back a long out of print sub-faction in the Genestealer Cult. 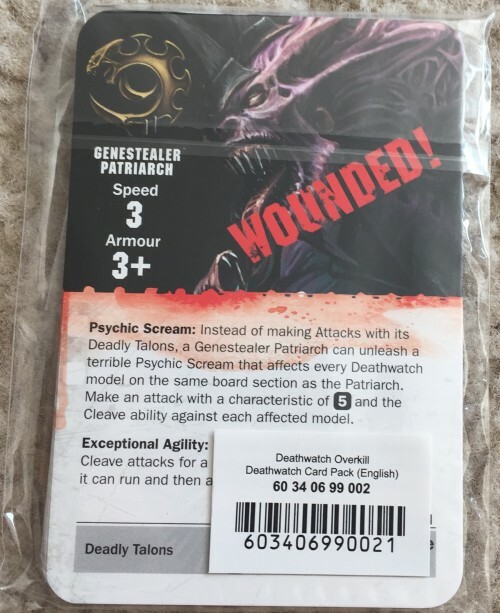 Human-Genestealer hybrids? Yuck. No wonder the Deathwatch has been called in! 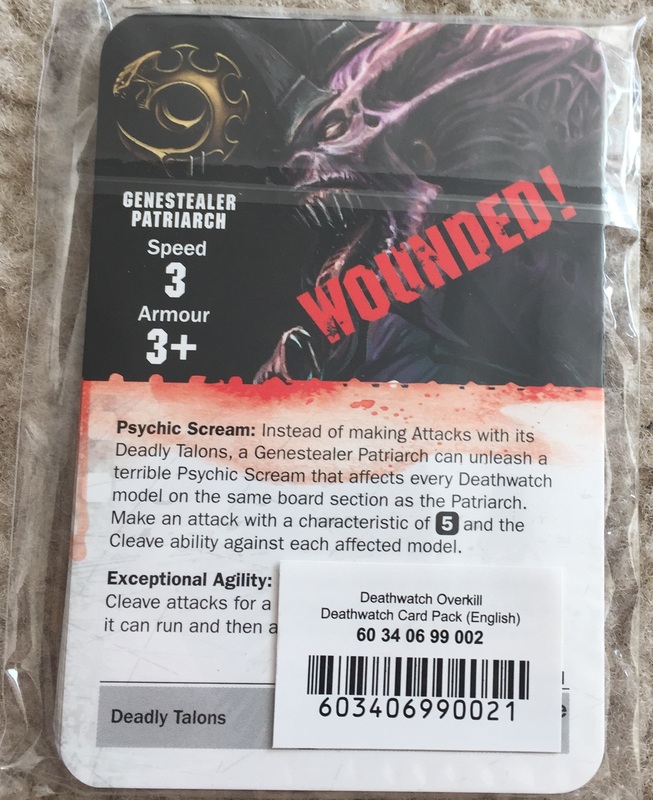 Since Games Workshop was kind enough to send us a review copy, I thought I’d do an Unboxing for you so you can see what all comes in this large package. 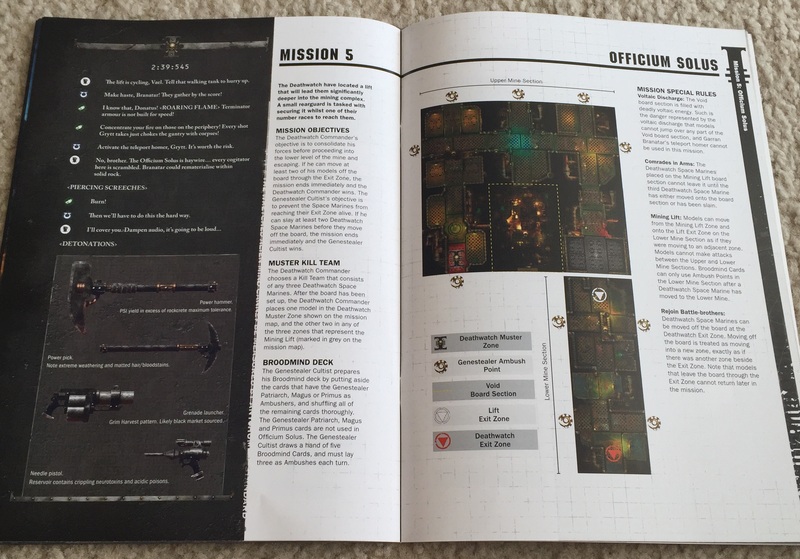 Whether you’re thinking of getting Deathwatch: Overkill for the minis to add to your Tyranids or Space Marines 40K armies, or you just want another board game to add to your collection, come with me as we look through roughly three dozen pictures, showcasing what this game has to offer. 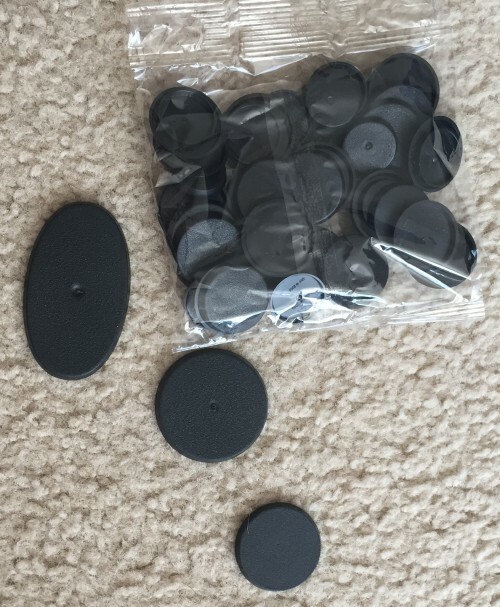 A warning for newcomers to GW board games, make sure you have a way to remove the pieces from the sprues as well as some plastic or super glue, as some assembly is required. Now, let’s look at the game! 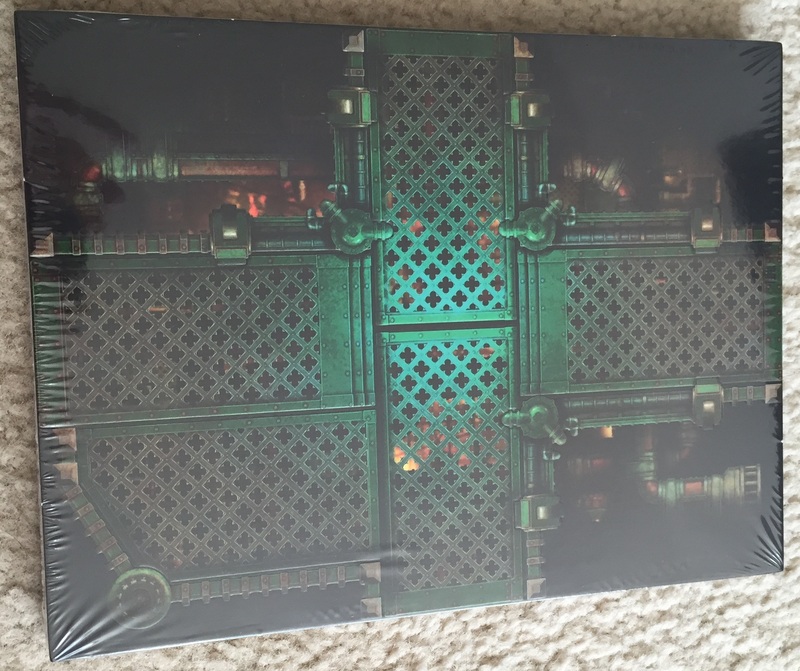 To start, here’s a look at the game, still in its shrink wrap. 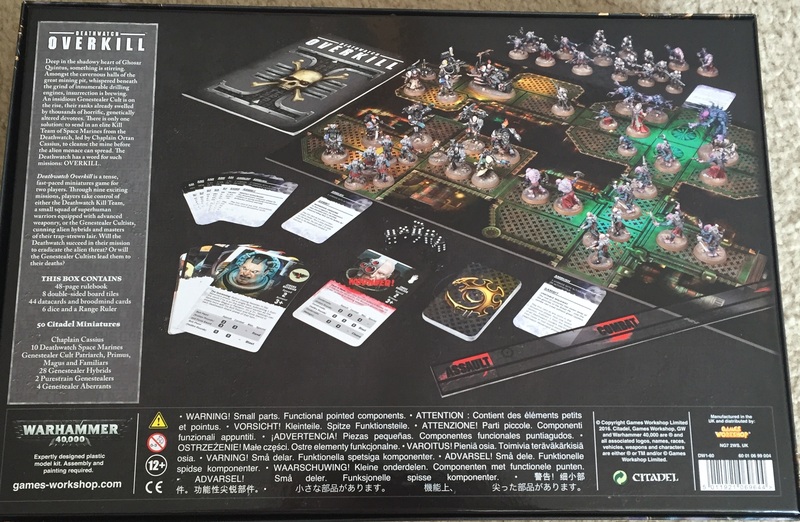 Here is the back cover of the box. 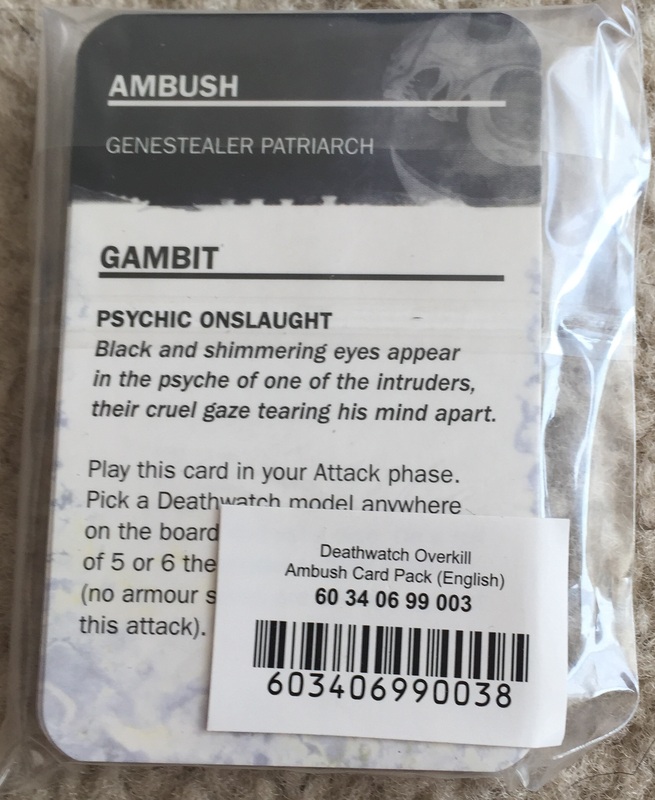 The box with the lid removed. 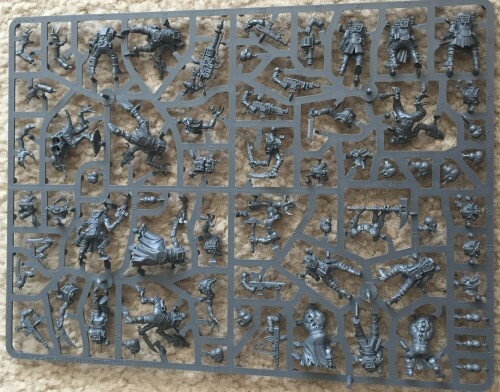 Look at all those hard plastic minis waiting to be assembled. There are FIFTY of these, which means even if you buy the case for JUST the figures, you’re only playing about $3.30 per tiny dude. That’s a good deal. 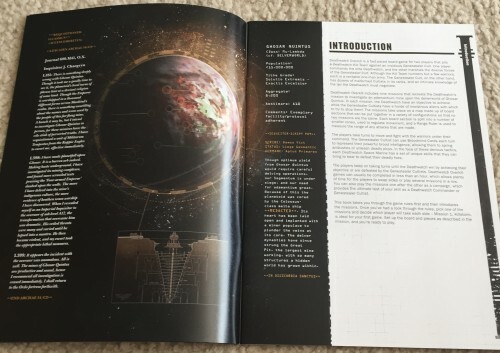 The cover of the rule/mission book. A look at some inside pages from the rulebook. 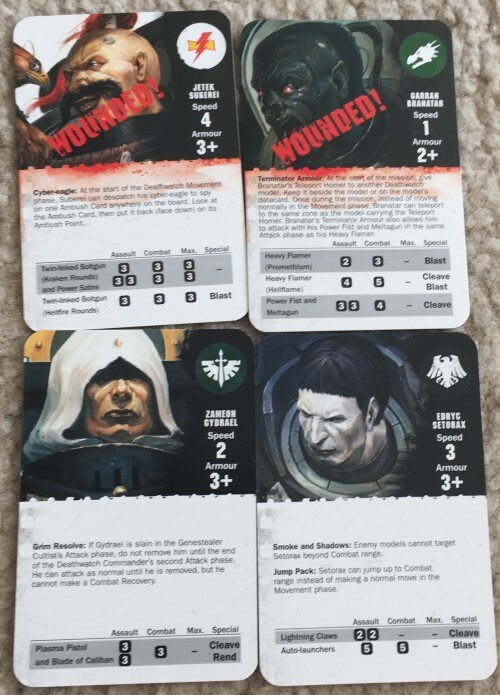 A look at three of the Space Marines in this Deathwatch set. There are eleven total. My only complaint is that almost all the figures are from your usual lines put out like the Ultramarines and Blood Angels. Why not instead of a Dark Angel, the game contained a Guardian of the Covenant. 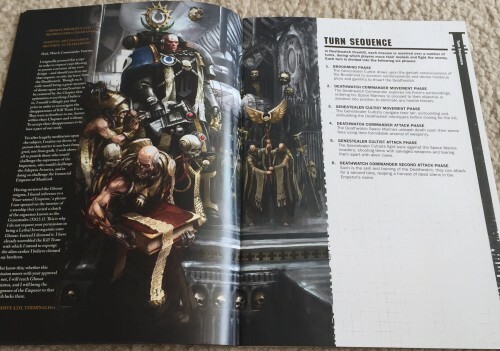 That way you’d get a little more diversity, introduce some lesser known factions to newer or casual players, and perhaps inspire someone to start an army featuring that Adeptus Astartes. 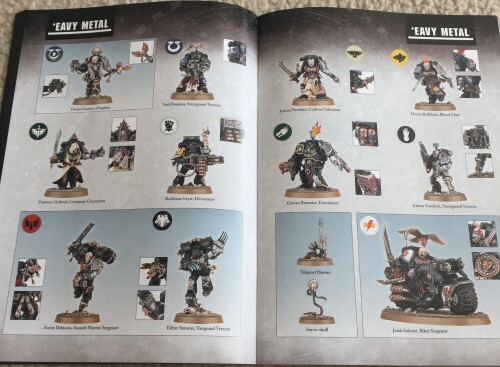 Can you imagine the internet storm if there had been say, a Soul Drinker instead of an Imperial Fist or a Mantis Warrior instead of a White Scar? A huge missed opportunity IMO. Just look how excited people were when they learned we were getting an actual Raven Guard miniature. Okay, I’ll stop ranting. Let’s move on now. 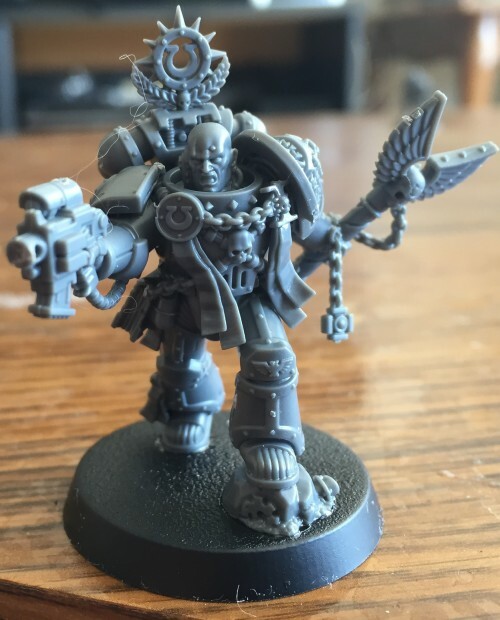 A look at the ‘Eavy Metal team’s paint jobs on the Deathwatch figures. A look at the ‘Eavy Metal team’s paint jobs on the Genestealer cult. A look at one of the missions from the rulebook. 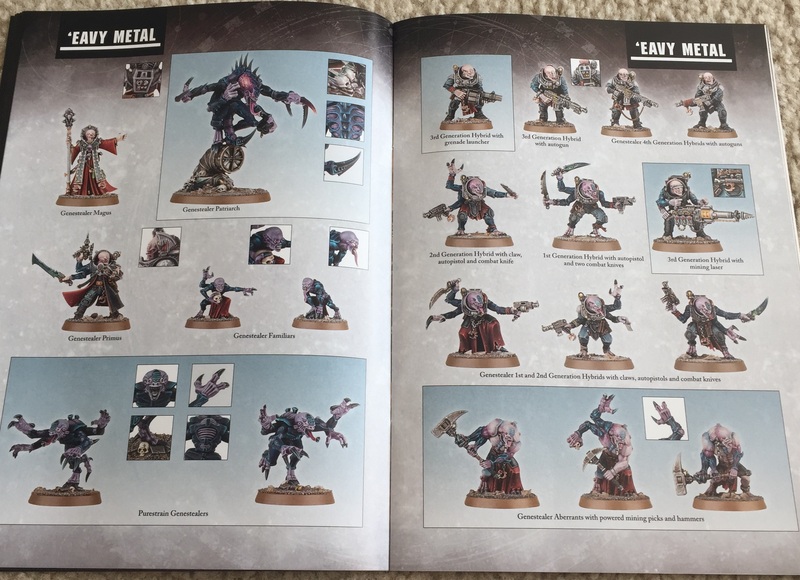 The instruction guide for assembling the miniatures. 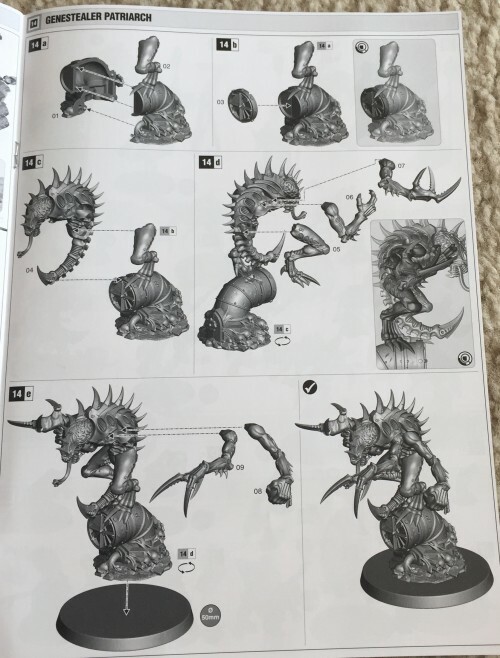 How to assemble the Genestealer Patriarch. 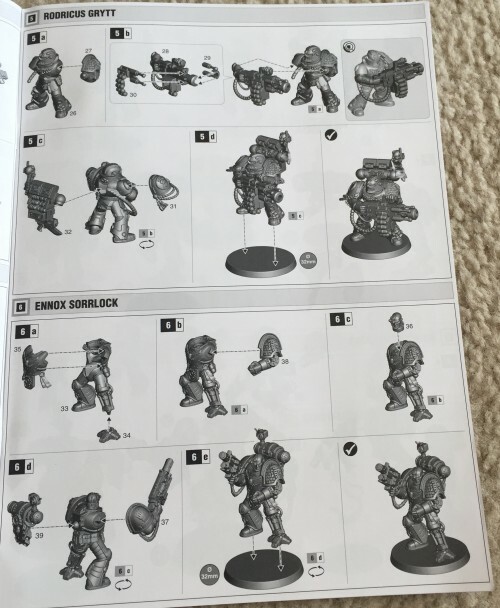 How to assemble some Space Marines. Now from looking at these, you can tell assembly is easier than the usual sets you buy from GW or your local brick and mortar gaming store. These are NOT snap together pieces like with Space Hulk or Dark Vengeance, but they are somewhere inbetween that and your usual boxed sets. So assembly is easy and quick, but you don’t have the ability to make your own poses and switch out weapons. 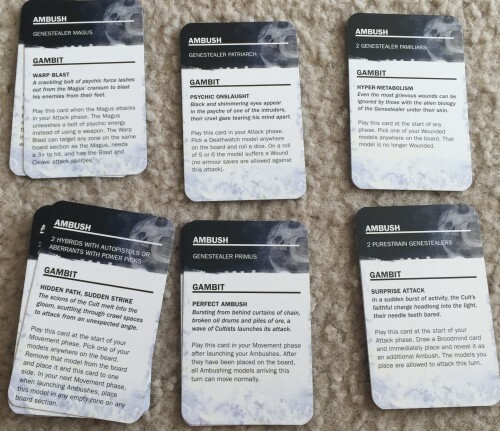 You get one option for each character, like with any GW boxed set. The board game tiles, still in shrink wrap. 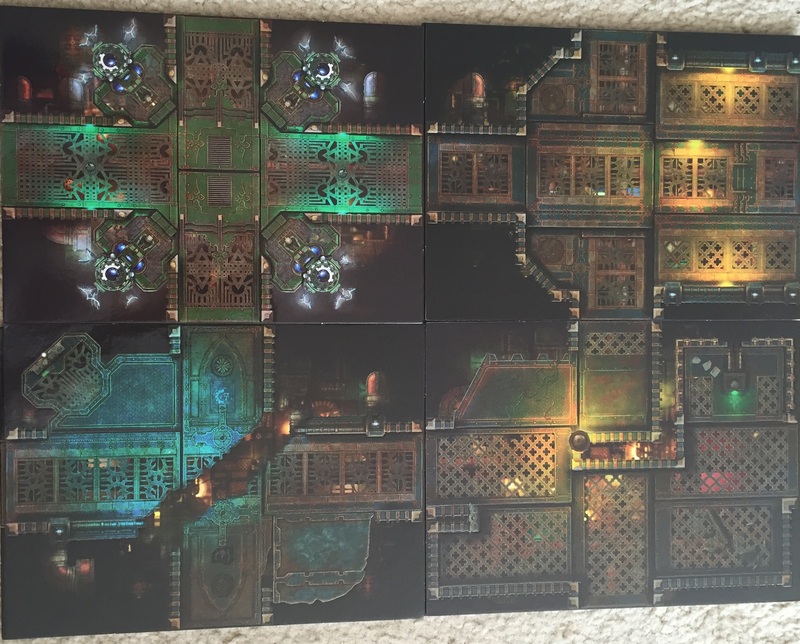 A look at four of the tiles. Each tile is double sided and although you can’t tell from the picture, they are also textured and embossed, which was unexpected. It makes the tiles seem really impressive too. I’m very happy with them. Bases! There are actually five different base sizes in this package and we’ll take a look at them in detail later on. The Deathwatch Card Pack, still in its sealed plastic case. 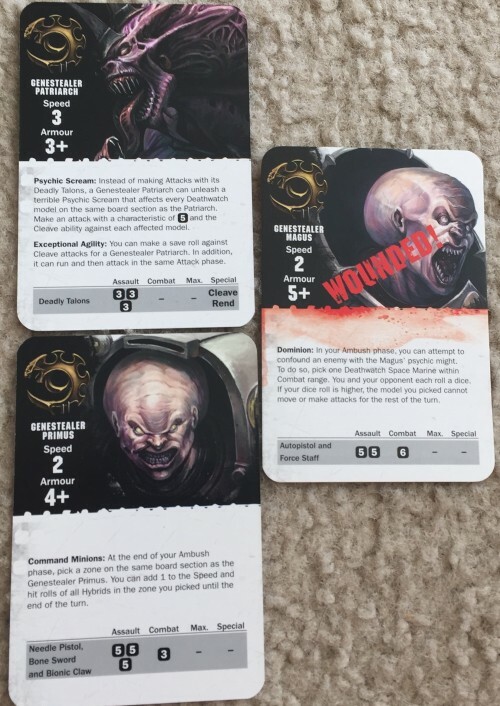 Here is a look at some of the Genestealer cards from the Card Pack. 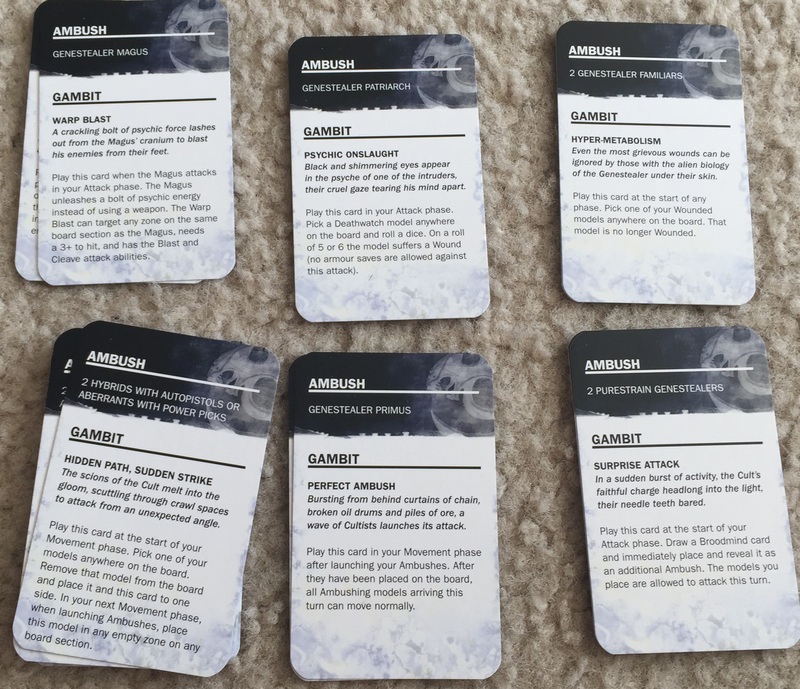 Each card is double-sided. One shows a healthy character, while the other shows a wounded side. 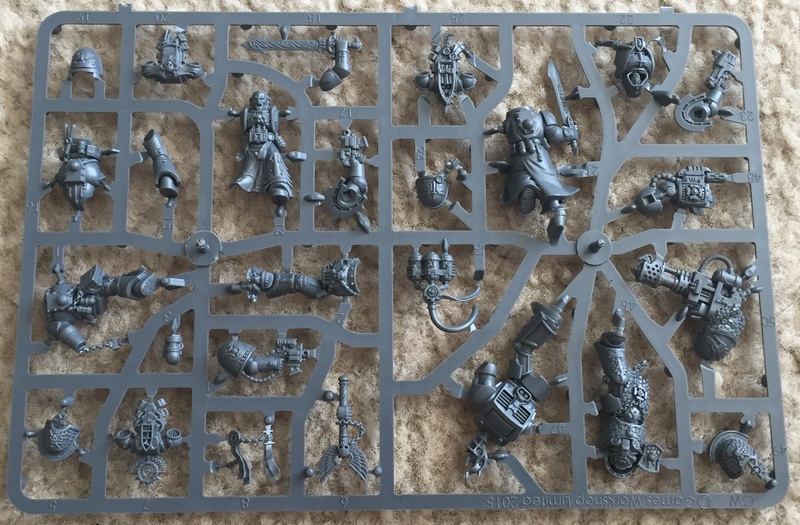 This is the same as the previous picture, but these are the Deathwatch Space Marines. Again, the cards are double sided. Note the special powers on each Space Marine here. Ruler and dice. Nothing more, nothing less. 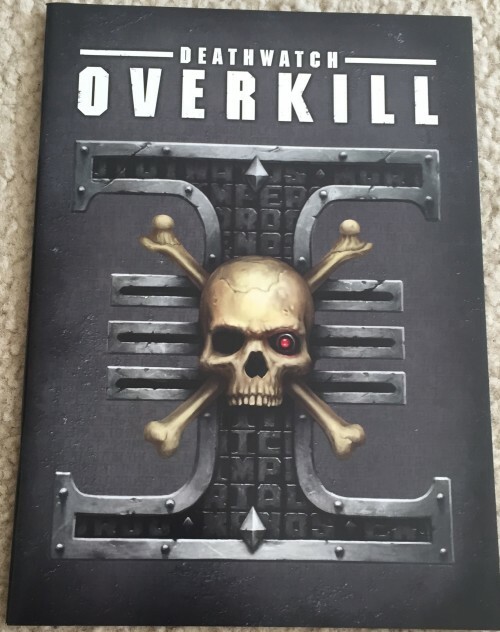 A sample selection from the Overkill card pack. The first of five sprues from Deathwatch: Overkill. Notice the high level of detail on each piece. GW didn’t cut corners simply because this was a board game. 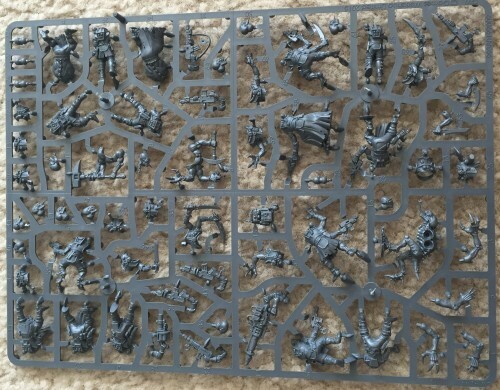 The second of five sprues that come with the game. Remember, there are FIFTY figures to assemble and paint. The third of five sprues. 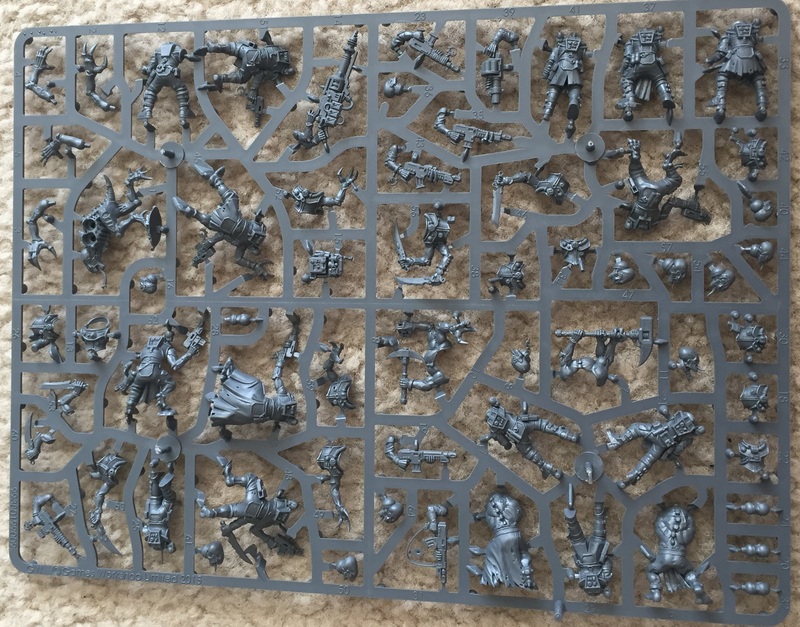 This one contains the big bads for the Genestealer army. 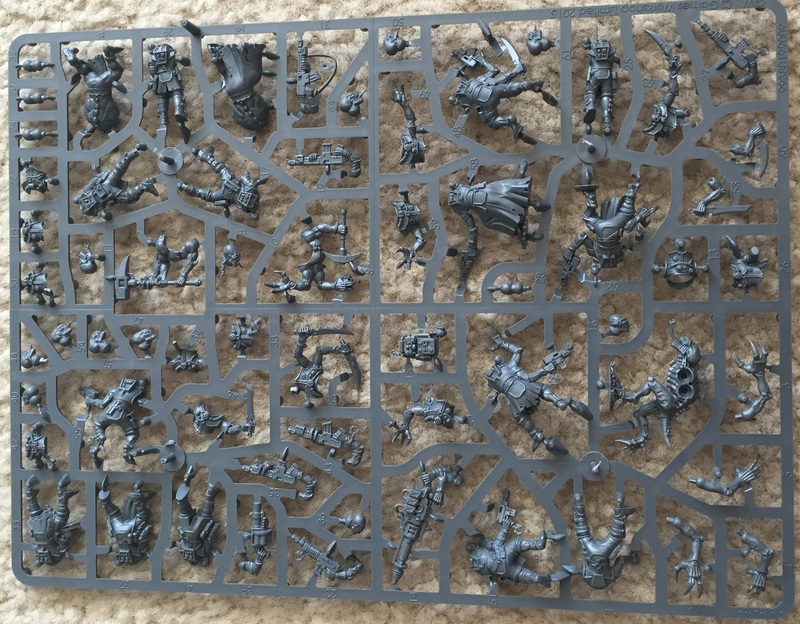 The fourth of five sprues. 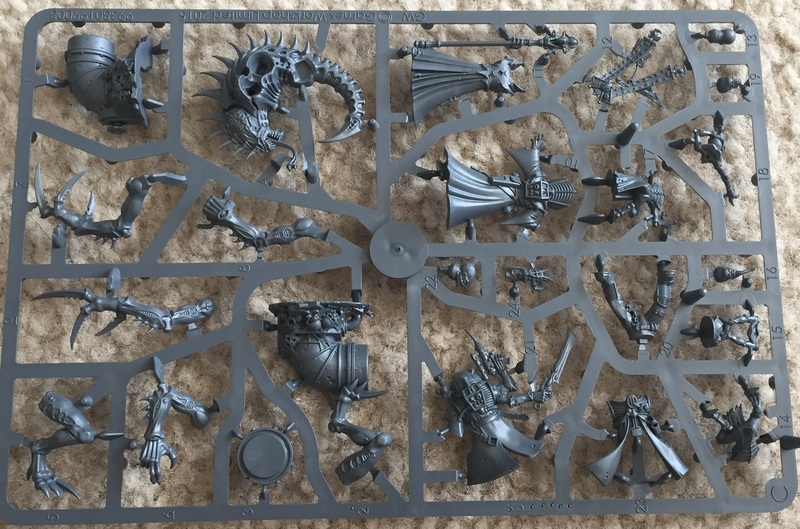 The fifth and final sprue. Don’t be intimidated if this is your first GW game. You’ll be able to cut these guys out and assemble them in only a few hours. In fact, here are five figures I assembled in only a few minutes. That’s 1/10th done! Note that each figures is on one of the five different base sizes. 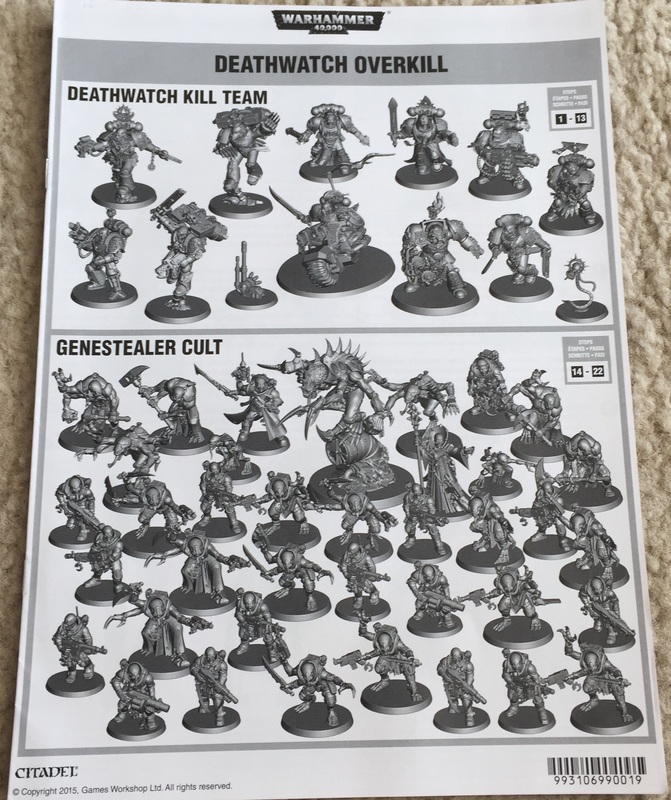 The fourth Gen Genestealer Hybrid is on a 25mm base. The Space Marine is on a 32mm base. 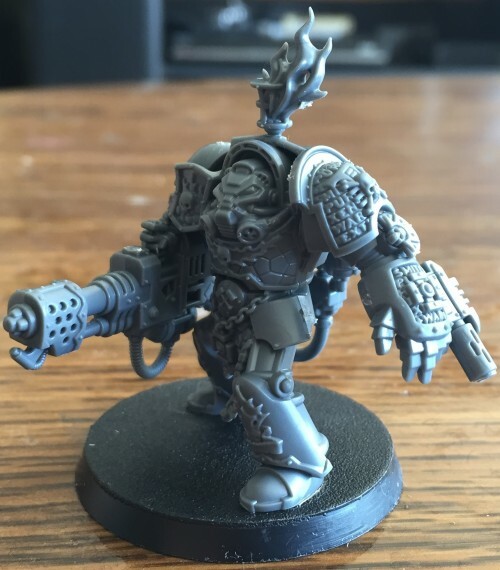 The Terminator Armor is on a 40mm base. 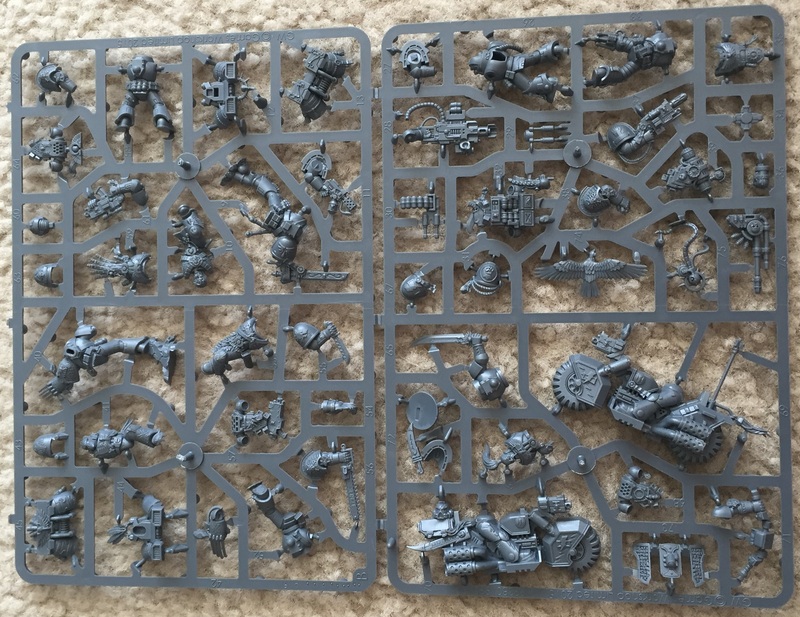 The Genestealer Patriarch is on a 50mm base, and the bike is on a 75mm base. So when you start to assemble, make sure you get the right base size for your figure! A close up of the Fourth Generation Genestealer Hybrid I put together. 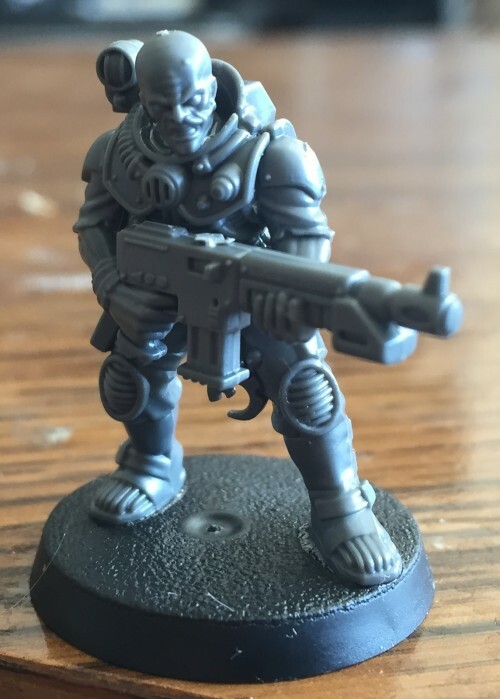 The Space Marine Garran Branatar (from the Salamanders) in Terminator Armor. 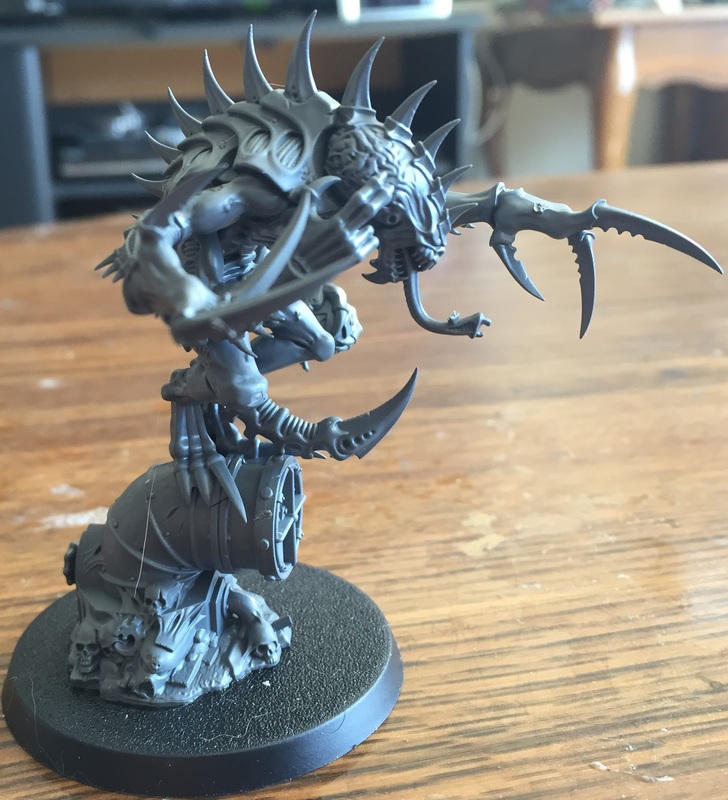 The Genestealer Patriarch in all its glory. Yuck. 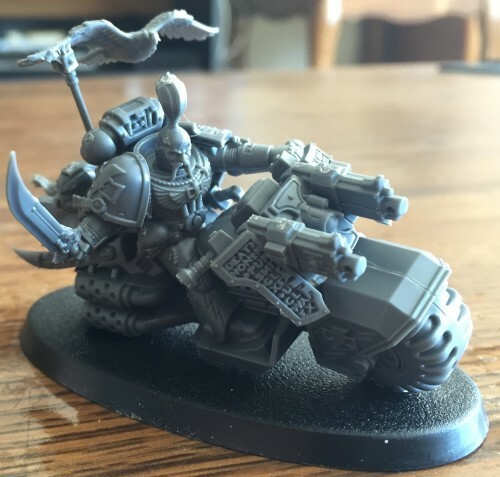 Finally we have the White Scar Jetek Suberei on a bike (rather than a Ravenwing!) along with his Cyber-Eagle. This was the only one I had even the slightest trouble assembling and that was simply getting the eagle to balance properly. I haver to say all five person were quick and painless to put together. It’s just going to take time to assemble everything. So there you go – an unboxing of Deathwatch: Overkill. I have to admit, even though I prefer fantasy to Sci-Fi, I’m really impressed by the pieces in this set and can’t wait to play it. 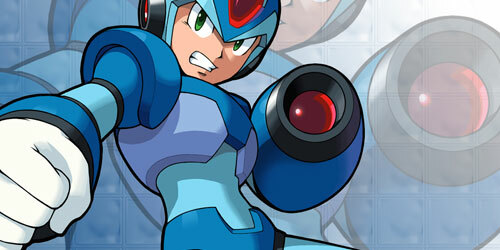 Check back in a few days for our official review. Maybe I’ll even get a few pieces painted up by then. I preordered the game and finally picked it up today. 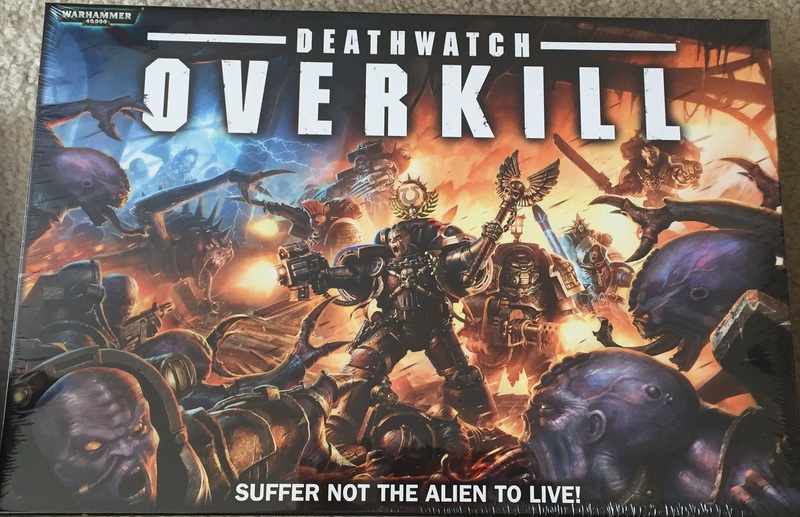 So glad I did as for I can use this game, use the minis in another game of 40k, and just all around beautiful miniatures. 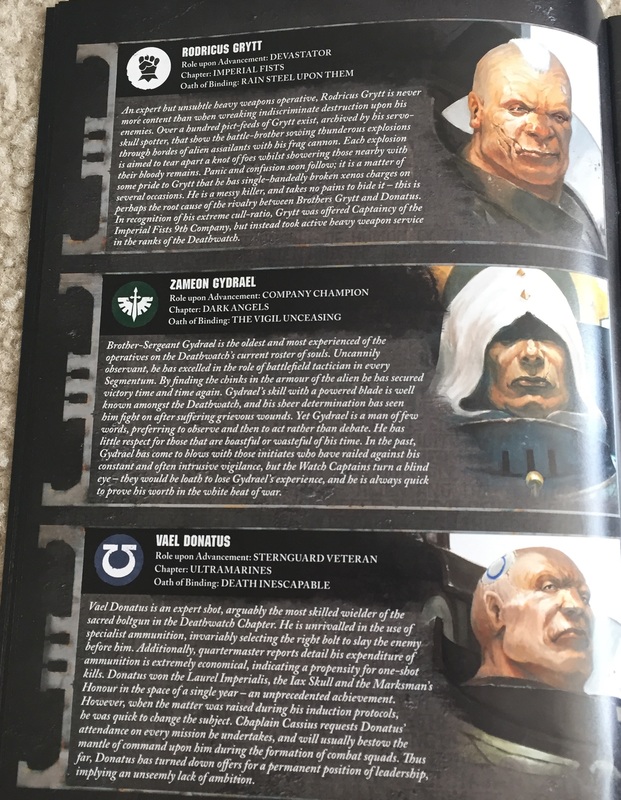 I am actually very happy they choose the most popular faction. It brings recognizable Marines together in one team especially for my son who I primarily play with. 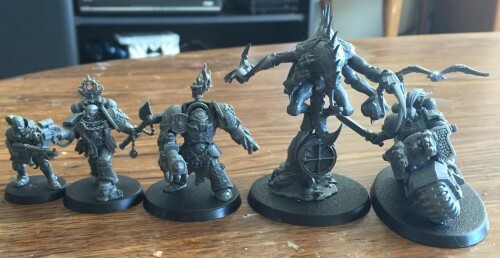 Though to a semi veteran I would have loved to see my favorite Black Templars, but again I like the universal appeal.